GIS Market « Global Market Insights, Inc.
With location-based analytics and mapping forming an essential part of the future smart & sustainable technologies, GIS market is going a transformation of sorts in the recent times. Over the years, strong technological proliferation in geospatial services for remote sensing platforms and navigation have further accelerated the adoption of GIS solutions for obtaining critical information and real-time location data. With improved operational efficiency and enhanced decision-making, the advent of GIS technology has irrefutably brought a commendable transformation in the recent years. Enumerated below are few examples of how GIS technology is faring across the popular industries. As an industry that has registered itself as a vital part of the global economy, this capital sensitive oil & gas sector is one of the most lucrative segments of the global GIS industry. In fact, statistics depict that the oil & gas industry is driven by an anticipated 80% data that has a spatial component, harnessing geographical & spatial information at every possible stage of the life-cycle right from basin analysis to E&P activities to distribution and pipeline management. With GIS industry further bringing in extended spatial analytics and advanced mapping, the oil & gas sector is indeed emerging with the highest potential of GIS application over the entire life-cycle. The agricultural sector has now widely adopted GIS and spatial mapping technologies for better assessing crop conditions, weather, and topography related information. The rapid adoption of drones for precision farming and agricultural applications have furthered the demand for GIS, in turn favoring the business growth. Estimates in fact claims the global GIS market from the agriculture segment to register a healthy growth rate of 15% over 2018-2024. The global GIS industry is considerably thriving on the copious amount of geospatial information used by the government agencies for taking data-driven decisions on national & state welfare. The government sector is in fact seen increasingly investing in deploying GIS software across the military, defense, and aerospace for carrying out terrain analysis, crucial surveillance as well as reconnaissance operations, battle field management, and monitoring of possible activities of terrorism. How is GIS helping to streamline regulatory processes? As the utility of GIS is rapidly gaining momentum across the popular industries, the area of regulation & environmental litigation is particularly forming a profitable investment ground for potential stakeholders. The modern GIS technologies are helping the regulatory agencies to strictly monitor public lands, protect environment, and in conserving water resources. Recently for instance, the Maharashtra (India) government has announced that it will be using the GIS mapping technology for identifying the illegal constructions in more than 170 major cities. According to the officials, there is no prevention nor any steps are generally taken to stop illegal construction. It is only after a building is constructed & people start residing, the issue is ranked up. The regional GIS market in this regard is thus gaining traction as the satellite mapping technology is expected to help the government monitor illegal construction at an early stage. Smart Policing is another major concept that is emerging rapidly due to technological advancements brought forth in the global GIS industry. The police agencies worldwide are using geospatial technologies for identifying crime hot spots, mapping crime, identifying areas prone to inmate violence, and parole management. Thus, allowing the law enforcement authorities to better monitor situations, the GIS technology is witnessing strong adoption in streamlining regulatory process, which in extension is taking the growth curve of global GIS market several notches up. 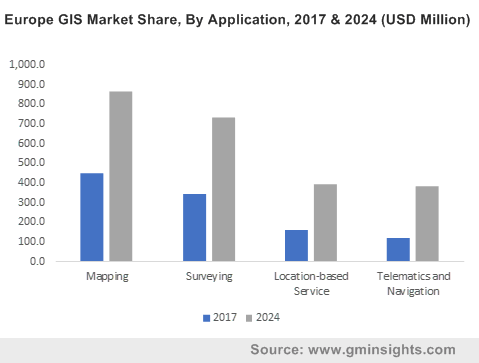 According to a report compiled by Global Market Insights, Inc., the global GIS market is estimated to be pegged at USD 4 billion in 2017, and is projected to hit a remuneration portfolio of USD 9 billion by 2024, depicting a 12% growth rate over the timeframe. Taking into account the regional landscape, the North America GIS market held a dominant share of 40% in 2017, given the rapid adoption of geospatial technology across myriad industries. With an anticipated CAGR of 15% over 2018-2024, the Asia Pacific GIS market, according to reports, is expected to emerge as lucrative investment hub for potential stakeholders. On account of the vast application and regional scope it comes as no surprise that the GIS industry players are making rapid headways in reinforcing their global positions in unique ways. Recently, for instance, a GIS startup AmigoCloud has announced that it is on a mission to make satellite mapping easier. In order to make digital mapping available for everyone, the company has developed a unique cloud-based GIS app which can be downloaded from Google Play and Apple Store. The proliferations of such different start-ups and core industry players, is undeniably expected to propel the commercialization potential of GIS market in the ensuing years. This entry was posted in Sustainable & Smart Technologies and tagged Agriculture, Construction, Desktop GIS, Geographic Information System Market, Geographic Information System Market Research, Geographic Information Systems Industry, GIS Collectors, GIS Industry Outlook, GIS Market, GIS Market Analysis, GIS Market Share, GIS Market Size, Global Geographic Information System Market, GNSS Antenna, Government, Integration & Maintenance, LiDAR, Location-based Service, Managed Service, Mapping, MINING, Mobile GIS, Navigation, Oil & Gas, Surveying, Telecommunication), Telematics, Total Station, Training & Consulting, Transportation and Logistics, Web GIS.